A lot of times I get this question, "I want to have a nice photography set but I don't want to pay too much and I don't want screw lenses." (Authors note, there is nothing wrong with screwing) The point of this article is to prove that you don't need to get expensive equipment to make your own good photoset. So here it is... a buy report. Allthough M42 screw lenses and bodies are cheap and it is easy to make a good working set with them, a lot of people don't want to use a screwlens. They hate it. But there are alternatives. A while back I started to use K-mount. Lenses for this mount are getting cheaper all the time so I decided to take the plunge. I started out with a Zenit-AM2. Here is the set I build in roughly six months of searching. Toms very very low cost K-mount system. And here it is, ne very useable K-mount set for 302 dollars also take in account some shipping (for the AM2), so about 320 dollars for a very good set with a range of 25 to 200 mm. But.... please bear in mind that these are bottom prices. You can't find this stuff at any lower prices than this (or maybe a lucky find). All of this is second hand, no new stuff here. The Lenses were happy accidents. I stumbled into a camerashop and they had a sale on K-mount. So I bought a nice Takumar-A which even has a macromode. The Panagor Macronet adapter was a lucky find in the same camerashop. The VarioZenitar 25-45 was an Ebayfind and allthough I don't like Ebay I won this one (which suprised me). The question of quality now pops up. Lets start with the AM's standardlens. The Helios 44-4K. Good lens, 2/58mm multicoated. All glass all metal. 52mm filter thread. Sharp, contrasty. Its good. 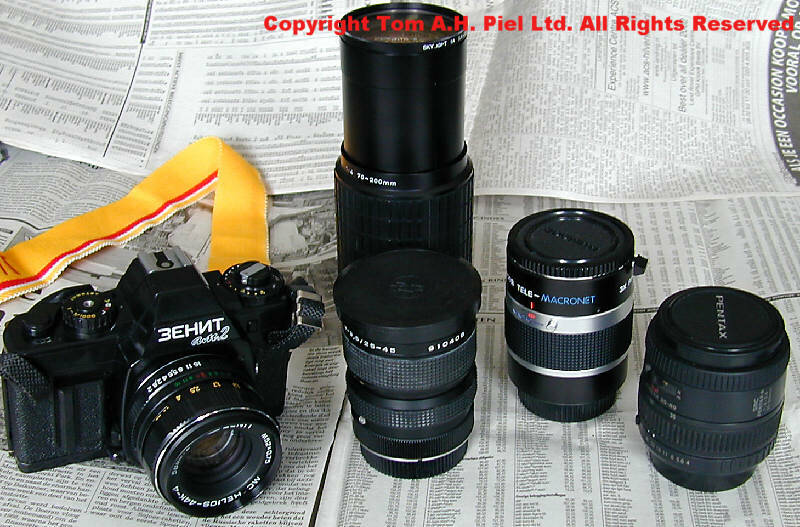 Pentax Zoom 35-80, standard zoomlens from Pentax. Its nice, not spectacular but it gives you range, has macromode and gets the job done but not fast at fstop 3.5. Very light but it is partially made of plastic. Which gives it a cheap feel. But it is multicoated. The Takumar-A 80-200. Good for a 80-200 zoom. Opticly it is the same as its more expensive AF brother. It is a one touch zoom, slide for zoom turn for focus. Easy lens, fstop 4-32 AND has a macro mode. All metal, all glass lens and multicoated. The VarioZenitar 25-45. The odd one out. You won't find this one easy so call this a lucky find. Two touch zoom, one focusring, one zoom ring. Made by KMZ itself and a very good lens. Nice wide angle at 25 mm, no distortion. Came with two filters for black and white aswell. But hard to find. So if you see it in a camerashop and the price is good, just get it. All metal lens, all glass, no plastic stuff here and multicoated. The Panagor Macronet adapter. It beats putting in rings. It adds macrocapability to this set at a better level than the zoomlenses can. It gets close and I mean really close. Around 5 centimeters and up. Also all metal and with a internal coated lens element. Conclusion, what have we here? This set can keep up and even outperform a present day slr. It just depends on the photographer.